We hope you had a Merry Christmas and are enjoying spending time with family and friends this Holiday season. As you already know, Congress has passed new tax legislation that will go into effect for 2018. This is the largest tax bill passed in 30 years and it will take some time to digest all of it. That being said, we want to provide you with what we feel are the highlights and the items that are most likely important to you. 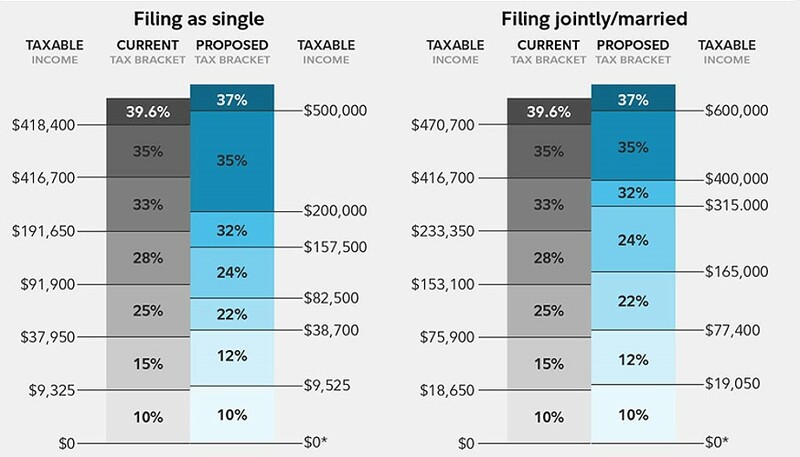 The new tax code changes both the individual and joint filing tax brackets for 2018. These changes are temporary and are set to expire as of December 31, 2025. Congress would need to act prior to this date to make these changes permanent. The new bill combines the personal exemption and standard deduction into a single higher standard deduction, which will be indexed to inflation. The child tax credit increases and there is a new dependent tax credit. The higher standard deduction for people age 65 and older still exists. These new provisions will expire after December 31, 2025, and the rules would return to current law. The new higher standard deduction means it will likely make sense for fewer people to itemize deductions. Therefore, charitable gifts, medical expenses, home mortgage interest, and other itemized deductions, will all face a higher threshold before they become useful. In addition, the proposal directly changes or limits a large number of deductions and credits. Limited to $750,000 of mortgage debt. This provision would be applicable for taxable years after December 31, 2017 and beginning before January 1, 2026, when the limit would return to $1,000,000. Eliminates deduction for interest on new home equity loans until taxable years beginning after December 31, 2025. Expenses greater than 7.5% of AGI could be deducted for the next 2 years only. The legislation roughly doubles the federal estate tax exemption to $11 million per person ($22 million per couple). That limit would be indexed to inflation, but would expire and revert back to current law after 2025. AMT was designed to prevent high-income individuals from avoiding income tax by piling up deductions. It is essentially a parallel method for calculating your income tax liability, but removing some itemized deductions. The tax reform legislation makes changes designed to limit the impact of the tax. The plan will raise the minimum income level at which the AMT could apply, from $50,600 to $70,300 for individuals and from $78,750 to $109,400 for couples married filing jointly. Corporate tax rates will be cut to 21% beginning in 2018. That tax cut is not scheduled to expire. As a result, you have likely already seen some U.S. companies offer bonuses and announce pay raises for 2018. Pass-through businesses, businesses structured as sole proprietorships, partnerships, and S-corporations, will be taxed at individual tax rates, but will be able to deduct 20% of income. The tax bill allows 529 college savings plan assets to be used for education expenses for grades K—12 as well as college and post graduate study. This is just a quick summary of the highlights of the changes coming for 2018. Should you have any questions or would like to discuss how these new laws may impact you personally, please feel free to give us a call to discuss.